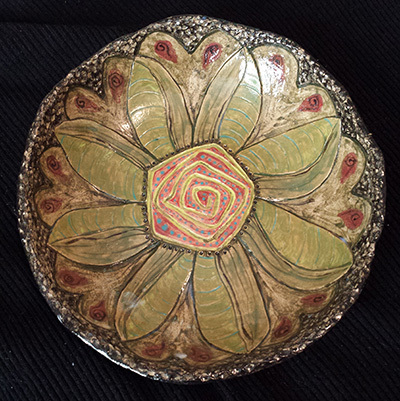 Karen will cover the use of underglazes, carving, and sgraffitto on greenware. She will also talk about some basic design principles that will help you to lay out a successful design on pottery. We will provide two greenware plates (about 6 inches in diameter) for you to carve and paint on. They will be fired after class with a clear glaze. This class is in the Clay Studio on Fri., May 10, from 6:30-9pm. Adults and teens are welcome. Clay studio members younger than 13 can also attend. People are welcome to bring wine or other beverages if they wish. Karen Flynn has a degree in Applied Design from the University of Minnesota, and has been working with clay for 5 years. Price is $28 plus $10 supplies and $3/piece for firing. Wear clothes that can get dirty.